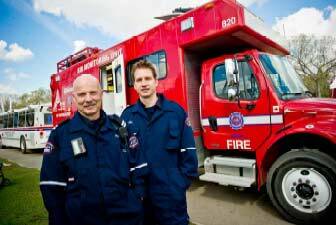 Fire Rescue Services improves Edmonton’s livability by protecting life, property and the environment. The provision of internationally recognized emergency services, fire prevention programs and public education make our city a safer place to live, work and play. As Edmonton continues to grow in area and population, replacing aging fire stations and building new ones helps ensure firefighters are there for citizens when emergencies occur. For example, the opening of a new fire station in southeast Edmonton led to an improvement in fire response times of 41 percent in neighbourhoods immediately around the station. Besides improving response times, the Meadows Station, which opened 2009, includes a number of features that promote employee safety such as an exhaust and air exchange system with carbon monoxide detection, as well as an off-gassing room for storage of bunker gear. As well, the $6.5 million project, along with the Capilano and Norwood replacement stations, incorporated energy efficient design to support The Way We Green, the City’s plan to make Edmonton more environmentally sustainable. Replacement of Fire Dispatch System (to be completed in 2014). Construction of the new Heritage Valley Fire Station (to be completed in 2013). Construction of Ellerslie Fire Station (to be completed in 2012). Construction of Lewis Estates Fire Station (to be completed in 2014). Conversion of the Fire Rescue Training Tower to burn liquid petroleum gas (LPG) to address firefighter health and safety issues and environmental requirements for live fire exercises. Planning for two new fire stations.